Our research focuses on the study of materials with remarkable properties such as high-Tc superconductivity, topological phases, multiferroicity or the use of these oxides for energy issues., mainly due to the strong electronic interactions. In addition to the fundamental issues they raise, these materials have promising features for certain applications. One of the strengths of the LNO group is to be able to implement various advanced techniques to synthesize high quality ceramics or single crystals cuprates, including bismuth cuprates (Bi2Sr2Can-1CunO8+), mercury cuprates of the highest critical temperature (HgBa2Ca2Cu3O8+δ with Tc= 135 K) at ambient pressure but also iron-based pnictides. These latter are very sensitive to chemical substitutions or to the modification of their non-stoichiometry in oxygen. These pure or substituted compounds, are elaborated and studied to capture the main features of the electron pairing mechanism. Recently an original procedure for the synthesis of single crystals of superconducting HgBa2Ca2Cu3O8+δ has been developed in the laboratory. These single crystals are unique with high quality surfaces paving the way for spectroscopic, transport and thermodynamic probes in order to understand the hole-doped cuprate phase diagram. A low-temperature vacuum annealing procedure made it possible to obtain the first crystals with very low doping, thus widening three times the doping range available for this phase. This work should allow a deeper understanding of the phase diagram of cuprates, in particular the origin of the superconducting dome, the true nature of the pseudogap and its relationship to the superconducting state. Another aspect of our research (coll. Sherbrooke University, Prof. L. Taillefer) is the synthesis, the characterization of materials to study different hole-doped cuprates in the highly overdoped region in order to understand the phase transition in doping between the Fermi liquid and the pseudogap. Many techniques are used, allowing the complete study of these unconventional superconductors, from synthesis to measurements of transport in an intense magnetic field. Besides superconductors, LNO group has also expertise in growing a large variety of high quality single crystal and thin films including the iridates (e.g. Sr2IrO4, SrIrO3, Sr3Ir2O7…). These iridium oxides have recently attracted attention due to the presence of a strong spin-orbit coupling and strong electronic interactions that give rise to original physical properties such as, the high critical temperature superconductivity or the state of topological insulator. Especially, the identification of a topological phase in these oxides should allow to explore new ways to manipulate the spin of electrons, a key point for applications in spintronics. Our aim is to study the emergence of Mott insulators, magnetic and topological properties in single crystals, single layers and heterostructures of iridates. This activity is part of a collaborative research project recently financed by a french ANR project.
. L. Fruchter, V. Brouet, D. Colson, J.-B. Moussy, A. Forget, Z.Z. 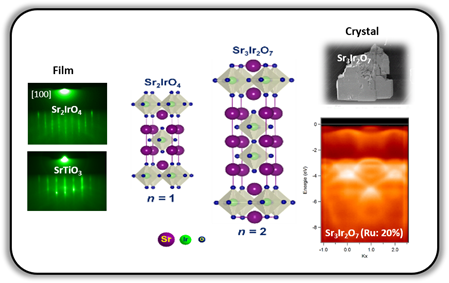 Li, Electrochemical Intercalation of oxygen in Sr2IrO4+d, Journal of Physics and Chemistry of Solids 112, 1-7 (2017).
. L Fruchter, D Colson, V Brouet, Magnetic critical properties and basal-plane anisotropy of Sr2IrO4, J. Phys. Condens. Matter 28 126003 (2016).
. L. Fruchter, G. Collin, A. Forget, D. Colson and V. Brouet, Sr2IrO4 magnetic phase diagram, from resistivity, Eur. Phys. J. B, 88 (2015). Multiferroic materials have the peculiarity to show simultaneously several coupled ferroic orders such as magnetic and electric orders. In addition to a rich underlying physics, their multifunctionality is therefore of high technological interest. In 2004, a pioneering flux growth procedure has been developed in the group to synthesis BiFeO3 single crystals of high quality. These present exceptional properties of purity and very high resistivity while being ferroelastic / ferroelectric monodomain. Our laboratory has intensively worked on this prototypical multiferroic material demonstrating ferroelectricity with record polarization (100µC/cm2) and anti-ferromagnetism at room temperature. Using neutron scattering, we also evidenced for the first time, a strong coupling between magnetic and ferroelectric orders in bulk BiFeO3 as well as exchange bias properties when in contact with a ferromagnetic layer. Some interesting properties with light were also discovered like photostriction and photoconductance. 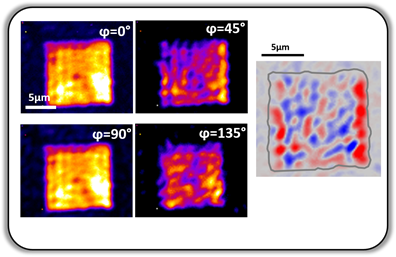 More recently, using soft X-ray resonant magnetic scattering (XRMS) in a close collaboration with the SEXTANTS beamline of synchrotron SOLEIL, we studied antiferromagnetic (AF) chiral structures in BiFeO3 thin epitaxial layers. On the other hand BFO is a perfect playground for antiferromagnetic dynamics. We recently used second harmonic generation to image these antiferromagnetic patterns in BFO thin epitaxial layers, subsequently demonstrating several ways of AF manipulation. On the other hand, since intrinsic room-temperature multiferroic materials are scarce, an alternative attractive option is to associate at the nanoscale, ferromagnetic and ferroelectric materials. To investigate and understand these heterostructures in which the magneto-electric coupling is based on the interplay between structural strain, electric and magnetic properties, our approach combines a large range of X-ray techniques to investigate all these properties including hard X-ray surface X-ray diffraction, X-ray reflectivity and K-edge Extended X-ray absorption as well as soft X-ray spectromicroscopy, circular and linear dichroism, and L-edge X-ray absorption at a number of European facilities (SOLEIL, DIAMOND, SLS, ESRF…). We explored several combinations of grown films based on ferroelectric BaTiO3 with ferromagnetic elements or layers. Fe and NiFe doping of BaTiO3 revealed a complex ion substitution scheme. 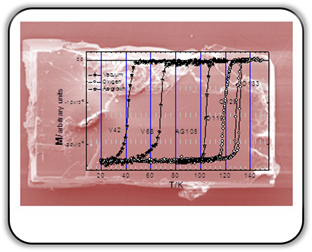 The perovskite structure is better preserved in the case of the co-doping. However, doping with these ferromagnetic cations revealed mostly antiferromagnetic long-range orderings. A direct magnetoelectric coupling could be identified when considering a planar interface between ferromagnetic Co and BaTiO3. 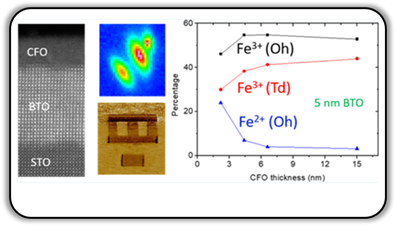 In the quest of a more stable configuration we have considered full oxide systems built with epitaxial ferrite layers of MFe2O4 (M = Co, Ni, Mn) composition that demonstrated a large range of magnetoelectric coupling as observed by spectromicroscopy on piezo-force microscopy prewritten patterns. 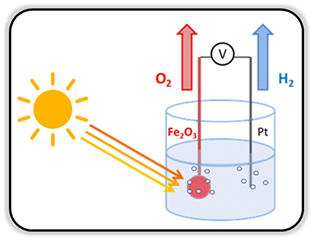 The transformation of solar energy into chemical energy stored in the form of hydrogen, through photoelectrochemical water splitting is a promising method that has the important advantage of being environment friendly and free from carbon dioxide emission. Several metal oxide semiconductors (Fe2O3, BaTiO3, TiO2...) used as photoanode are able to split water into hydrogen and oxygen. The efficiencies still need to be improved, several strategies are proposed to improve the photoelectrochemical properties like doping, nanostructuring or heterostructuring. We study the photoelectrochemical activity of epitaxial oxide thin films grown by atomic oxygen assisted molecular beam epitaxy (AO-MBE) on single crystal substrates. Such single crystalline samples are suitable model systems to study thickness, doping, crystallographic structure and intrinsic electric polarization effects on the photoelectrochemical properties [1, 2, 3]. The study of ferroelectric layers for solar water splitting is the core concept of the PHOTO-POT ANR project (2016-2019) coordinated by the LNO team. Since 2016, we develop also a new deposition method of nanostructured hematite photoanodes: aqueous chemical growth (ACG) which is more versatile and appropriate for large scale production. We study the influence of hematite nanorods orientations, doping, chemical composition and structure on the solar water splitting efficiency.